Identifying oversold stocks can help you make good investment decisions. 1. Does Being Overbought Hurt a Stock? "Oversold" and "overbought" are terms financial analysts use to describe stock market conditions. Whether the term is used in connection with a particular stock, the stock market or a commodity, the analysts are describing an imbalance between the supply and demand for those financial instruments. Oversold is the condition that occurs when a stock has dropped in price, and the supply driving the price down has dried up. 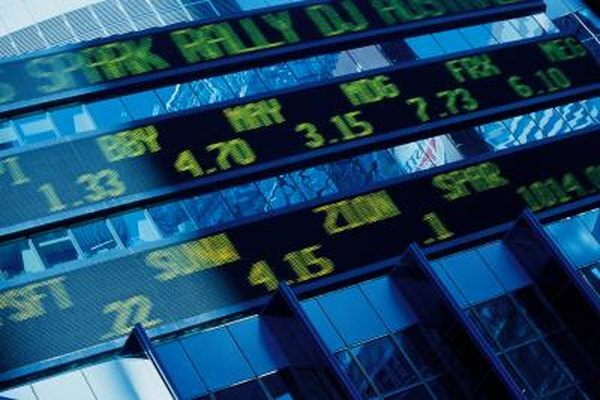 Stock prices move because of changes in the numbers of sellers and buyers. When there are more buyers than sellers at a particular price level, the price will be bid up until the buying pressure abates. Similarly, when there are more sellers than buyers at a particular price level, the price will fall. Falling prices lead to oversold situations. A stock that has been beaten down will become an attractive buying opportunity when traders sense that the downward momentum has stopped, and jump into the fray, resulting in an oversold stock. The concept of oversold is highly subjective. If a stock has dropped in price because of bad earnings or new products from the competition, the price decline is explainable. But if the stock is driven down for no apparent reason, it can be seen as oversold – the price has fallen too far, too fast, and becomes perceived as too cheap. One indicator that an oversold stock is bottoming is a high volume of trading as sellers dump their shares in fear of the stock's further decline. In retrospect, you can examine a chart and see where the turning point is, but in real time, there is no such advantage. Recognizing an oversold turning point is critical for traders who want to profit on a bounce in price. One method is to use Bollinger bands, a technical analysis tool that is found on many online stock charting sites. Bollinger Bands consist of three trend lines. The middle line is a 20-day moving average of the stock's price. On either side of the center line is a band that is two standard deviations away from the moving average. When the price of the stock drops below the lower Bollinger Band, the stock is oversold, and a rebound is likely. When the price rises above the upper band, the stock is overbought, and the price will fall. Another tool you may encounter as an overbought/oversold indicator is the Relative Strength Index. The RSI is a formula that translates price movement onto a 1-to-100 scale. The lower the value of the index, the more oversold the stock is; the higher the value of the index, the more overbought the stock is. If the RSI drops below 30, there is a strong likelihood that the stock is becoming oversold.